It accounts for variable rates: Because UPS and the U.S. 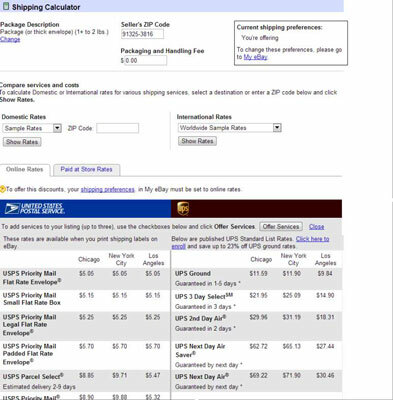 Postal Service now charge variable rates for packages of the same weight, based on distance, using the calculator simplifies things for your customers (and for you). Note: Be sure you’ve weighed the item. It includes your handling amount: The calculator allows you to input a handling amount and adds it to the overall shipping total — but does not break out these amounts separately for the customer. You may select up to three levels of shipping per item. You can check out the associated costs by clicking the Show Rates button, which shows you all shipping costs, so you can decide to ship with either the U.S. Postal Service or UPS. You can test your packages from your ZIP code to a ZIP code that is farthest from you. Doing this gives you an estimate for the most expensive option when shipping in the U.S.
eBay’s shipping calculator does not include Domestic First class (can be used for up to a 1-pound package) or First Class International (can be used for up to a 4-pound package). It also does not offer the options for domestic Regional Flat Rate Priority boxes. 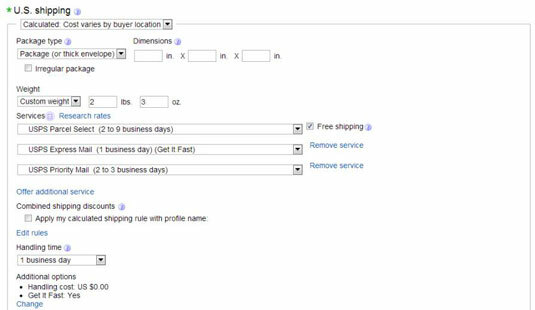 You can check out the fees for different shipping services also (after signing in) by using the full eBay shipping calculator. 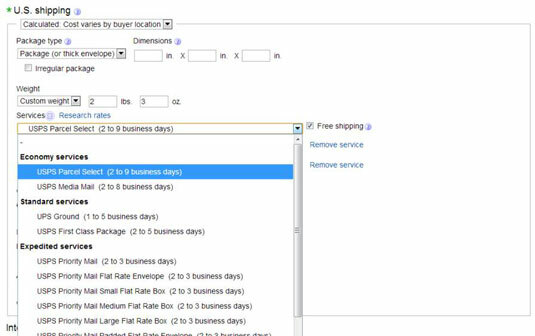 In the Shipping area, choose Calculated: Cost Varies by Buyer Location from the drop-down menu. Select your package’s type and weight from the drop-down lists, and fill in package dimensions as needed. Select a carrier from the drop-down lists. In the additional options, click to add a Handling Cost to cover your shipping expenses. When adding your packaging and handling charges, don’t worry that the buyers will see these individual fees. eBay combines this amount with the shipping cost and shows the total as one shipping price. After you’ve input all your information, you can forget about shipping charges, because eBay takes over.